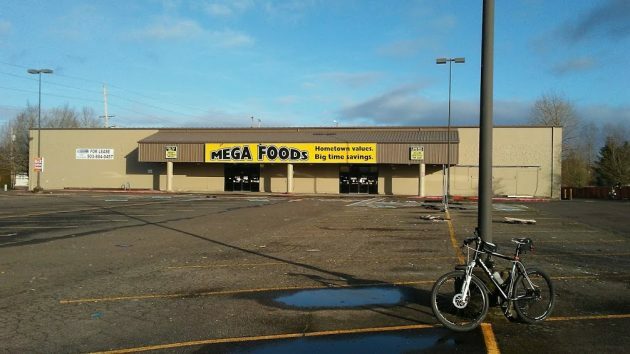 » What will become of Mega Foods site? The vacant former supermarket at 2000 Queen Ave. S.E. on Jan. 23. Some time after the 42,000-square-foot supermarket was built in 1990, the city changed the zoning to a category, “neighborhood commercial,” that allowed no stores bigger than 5,000 square feet. This didn’t affect the market, which operated until the owners closed it in 2017 because of stiff new competition. But last year a real estate agent told me the zoning made it impossible to sell or lease the place. The Albany Planning Division says the owners, who give an address in Santa Monica, have filed for a change in the comprehensive plan and the zoning map, from “neighborhood commercial” to “community commercial.” The city posted a public notice of the request on March 25. The planning commission will hold a public hearing on April 15, and a hearing before the city council is set for May 8. Assuming the change gets the green light, what will happen with the property? The owners haven’t said, and they may not yet have any definite plans. Land across Geary Street from the Mega Foods site is already zoned community commercial. That’s where The Wheeler-Dealer and the Ramen restaurant are in business. At the risk of irritating you with irresponsible commentary about the folly of zoning laws, I offer the following about the problem with coercive, centrally planned, land use. Coercive zoning laws involve arbitrary bureaucratic discretion over private property rights. On the other hand, a system of voluntary zoning between covenant holders is a better approach to determining how private property will be used. This approach ensures that rational economic calculation rooted in private interest occurs free of political advocacy and decision making. In the context of a free society, which do you prefer? Private land use governed by a coercive government, or private property where allowable uses are governed on a contractual basis between voluntary people? I suppose it boils down to who do you fear most – the folks in your neighborhood or your local government? Honest question: what is “a system of voluntary zoning”? Is that actually a thing, or is it another way of saying, “no zoning”? What a refreshing comment! Defending private property rights is as heroic and necessary as defending our country. Seems that your dalliance with the other side is over. Just to be clear, the property owners in this situation live in Santa Monica and are in no way part of the community. Whereas the “evil government” is making their decision using a community forum. So it sounds like you may have it backwards. The very use of the term “allowable uses” implies that some unit of enforcement somewhere would be making the “allowable” determinations. Is this not what the current zoning regulatory regimen already does? If so, then the proposed argument would simply replace one regulatory regime with another. Why bother? Just more bureaucratic expense to achieve the same result. I say Albany needs a place for kids to learn ice hockey! I had always thought the old Safeway building would be great. Ice Hockey sounds like fun. If you follow the model of some other facilities, there can be a floor that goes over the ice for other activities. Anything from laser tag or paintball to black light mini golf to court sports. I would never know what is happening all around me if it was not for you letting us know. I do not take the local paper any more because it was not worth the money.